... will throw up scores of configuration options which may or may not be useful depending upon the type of machine used and how the user intends to use it. And what about when you want to compare the differences between two different versions of a kernel ? 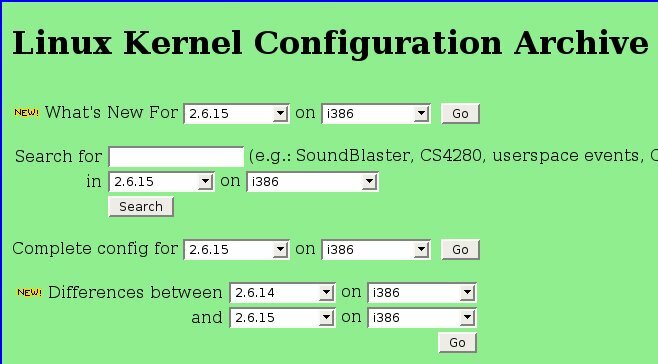 It would be nice to have a web interface where you can browse through the various configuration options of all the kernel versions and even get an idea of what each option accomplishes. Well, Jason Wies maintains a website called kernel.xc.net which covers this niche area. This site has a clean interface which helps the user to compare the configurations of different versions of the Linux kernel. While on this site, you can check what are the new features provided by any of the Linux kernel versions as well as know more about a particular configuration parameter. I found the search feature really useful. For example, to find out the kernel configuration options related to APM (Advanced Power Management), all I had to do was type in the word "APM" in the search box, select the kernel version and my machine architecture and press OK. And I was provided a list of all the places in the configuration related to APM. What is more, I get to know what APM stands for and a short help on the particular configuration parameter. And if you know more about a configuration, you can enter it in the message box on the page and communicate it to the author. All in all a very useful site for any one looking forward to compiling ones Linux kernel. this is indeed a very good article. the website makes most of the configuration tasks easy. just type in the name of device. enable it in the config and compile it to get the features built in.